David Williams - an Ojibwa artist who paints in the woodlands style. 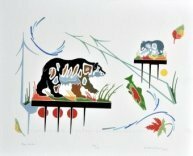 Ojibwa artist David Williams was a painter and printmaker. He was born at Garden River, Ontario in 1947 but lived most of his adult life in Saskatoon and in Winnipeg where he died at the age of 62. He is buried at the Garden River Reserve. Essentially self taught David began seriously experimenting with watercolour techniques in 1977. His imagery often combined geometric designs with a multitude of stylized images of animals in order to recall a time that has since disappeared. His images usually include three red and a yellow circle that represent his children - three boys and a girl. Mendell Art Gallery – Saskatoon. Saskatchewan. Saskatchewan Arts Board – Regina. Saskatchewan. Shell Oil Corporation – Calgary.